Long term client, Turner Motorsports returns to the WeatherTech championship for another full season in 2019.The Liqui Moly livery made its debut this time last year and was a challenge to marry the coloration of Liqui Moly and the graphics of Turner Motorsport in their non corporate colors. Thankfully it came out really well and has already been replicated on other cars (including a non BMW at SEMA!). The Liqui Moly livery returns for the endurance races this year with a small tweak or two. The traditional Turner based livery which I have also designed will also race during the season. 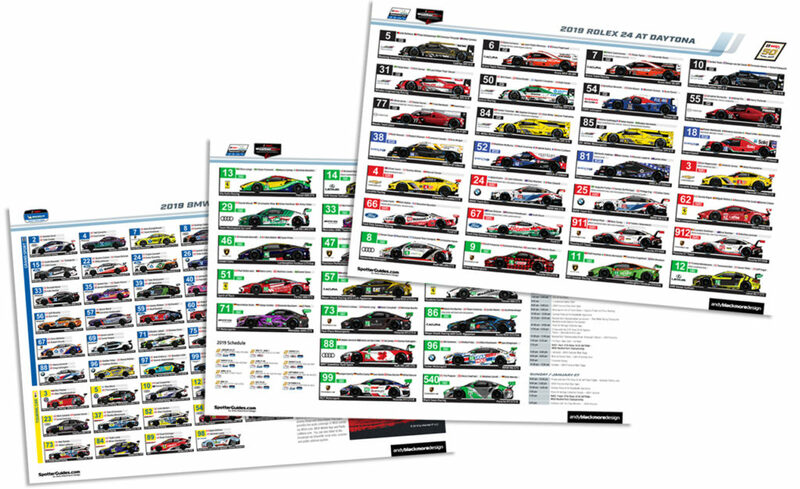 I have been able to design Volt’s liveries for the past three year on four different chassis. VOLT’s original brief was to ensure the livery stood out on track. With the fluorescent yellow base, it ticks that box. As with previous years, we’ve added some graphite elements to break up the mass of yellow. SkinzWraps did an awesome job of wrapping this and the sister chassis over Christmas at Porsche Motorsport North America’s base, where the car was still embargoed and secret. 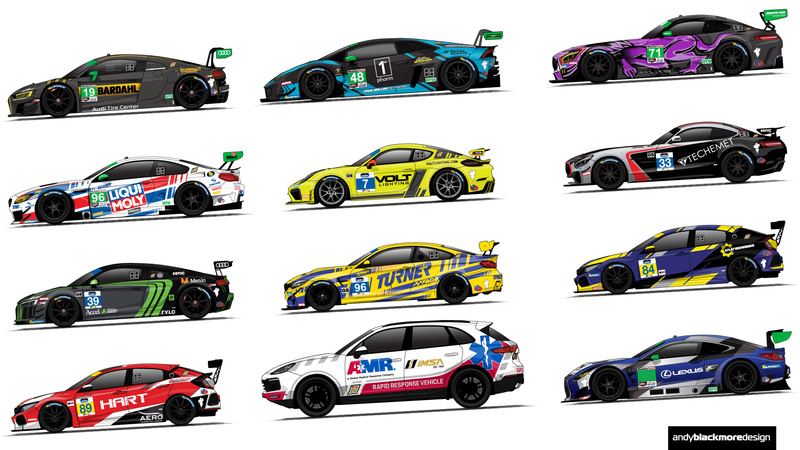 I produced this livery for the team last year and these cars will race in slightly different liveries for 2019 with the usual sponsor changes. The concept with this, and many of my liveries is for the base graphic to remain, regardless of sponsor and coloration to ensure the team creates its own visual identity. Motorsport is one of the few sports where the team rarely gets to show off ‘its’ identity. Another livery form 2018, this uses the AERO Paint system so the green really pops on this one.The Black comes from Menlo and the grey comes from Accel corporate identity. A 2nd chassis appeared at the ROAR test and will reappear at selected rounds of the IMSA championship. 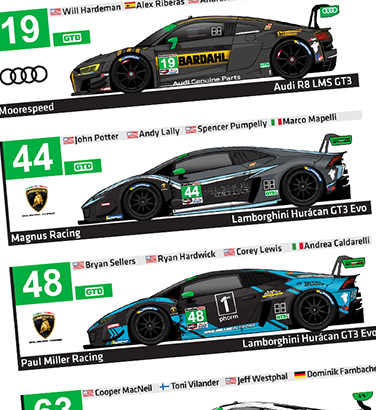 In addition to the Liqui Moly entry, Turner will be running the M4 GT4 at the Rolex24 weekend in their traditional colors. The car and base livery will feature as one of the lead cars in the Patrick Dempsey and Jeff Zwart produced movie, “The art of Racing in the Rain” which is due to launch later this year. I had previously designed a MX-5 livery for Winding Road Racing who was sponsored by ATL Speedwerks. The team wanted a base livery which would be distinctive in different coloration for different sponsors over time, starting with the Blue and Yellow base. The blue is a really deep vinyl with a hint of purple and allows the yellow to really pop on track. A commission from client AERO Paint, this livery is all in paint, no actual vinyl. If you are at the track you will appreciate the extra vibrancy and quality this gives the livery. A relatively clean and dynamic livery which picks out certain elements from a very busy body surface. Already a big favourite, the car has been christened ‘Scarlet’. The team consists of many volunteers from Honda’s production line in North America, so if you are looking for a cool team to support, here is your car. I also assisted LA Honda World and supplied RohR and TRG with vehicle linework for their press annoucements. In addition to these, I was also fortunate to be commissioned to produce some support vehicles on and off the track. IMSA AMR Porsche Cayenne Rapid Response Vehicle. I’ve been itching to design these liveries for a few years and had the opportunity over what was already a busy holiday period, but I couldn’t turn this down for one of my main clients. The new Cayenne livery introduced a new style for IMSA’s support vehicles in partnership with new partner AMR. Grey slashes on the hood give the emergency vehicle look subtly. These are at the same angle as the IMSA and IMSA50 logo. The AMR livery seen on their vehicles across the states is then adapted into a Porsche/IMSA look along the side incorporating the IMSA 50 logo and the ‘Star of life’ on the rear quarter. Audi Sport Customer Racing USA approached me in early January to deisgn a livery for the Rolex24 pace car as a retrospective of the championship winning Audi 90 GTO racecar. Following some research, we were able to locate the original colors of the car. The current R8 has very different propotions to the Audi 90 racecar, so I took time to work out the ratio of colors and then design the livery to fit the form of the current supercar, taking note of treatment on the original racer. As an example, the way the stripes on the front bumper are cropped by the air intake recess. the way the Red runs from the headlamp at the froont, or the small red kick up, just ahead of the rear wheels. Thanks to Audi for this fun project. Lexus approached me last year to create a new ‘works’ livery for their RCF GT3 Racecar so the could promote their look rather than a customer team at exhibitions and the IMSA Fan zone where many of the OEM’s exhibit. The brief was to have elements of the Toyota Gazoo livery, but feel new, fresh and a Lexus product using the deep Blue as a base. This RC F won’t be at the track, but will be in the IMSA fan zone and also appear on all of sides Lexus Motorsport Haulers.